Just read it and you may find even more (not diminishing the first objective in any means) — discussion on trends from globalization, facets of innovation, outsourcing strategy for OEMs and sales pitch for engineering companies, key tenets to enable the ‘knowledge economy’,… among other themes. I am sure that you will end up looking at our own business wondering : is our R&D organization logically organized to bring the best possible ROI ? are we ‘new solution creators’ or ‘replicators’, or ‘stuck in the middle’ for lack of understanding of these two extremes ? do our teams possess the transformational skills to thrive in today’s economy and how to nurture/promote them ? So, great book, great insight and relevant frameworks to think of your career and business, must read ! As a mid-level HR professional, I found this to be a very enlightening read. As someone who constantly finds oneself challenged with people decisions right from hiring, developing to firing, it is very relevant to understand how the STEM (science, technology, engineering and mathematics) professionals need to re-energize and re-skill themselves in ‘Transformational skills’ and be a source of New Solutions, moving beyond Replication Solutions. This resonates well with the HR agenda of providing relevant development opportunities to the professionals as a way of ensuring ‘stickiness’ as well as grooming technical talent. As a young, aspiring professional I found this book to be an enlightening and informative read. It outlines the changes our economy has seen as a result of globalization and information digitization and details the new challenges we face. The book goes on to describe ways to manage careers and how professionals must adapt to the new binary economy (read the book to learn what a binary economy is!). It encourages you to think of ways to take ownership of your career and strategize ways you can become a value-add to an organization. The book details the significance of developing a common language “between those who have a need and those capable of recognizing the need as an opportunity” and emphasizes the critical importance of developing transformational skills to establish New Solutions (again read the book to learn about New Solutions!). Thriving in the 21st Century Economy is not a light read. To take full advantage of what this book has to offer and develop a strategy to foster life long learning, it requires you to focus and really think about the concepts presented. If you give it your full attention I have no doubt you will walk away with ideas that will help you thrive throughout your career. For the past decade almost, I have worked in engineering education in Ireland. In my opinion ‘Thriving in the 21st Century Economy’ is an essential read for anyone involved in continuing education and lifelong learning. It describes in succinct terms, the challenges for all organisations in the 21st century and then presents a much-needed framework for transformational skills, to sit alongside the academic education framework and the workplace/industry skills requirements. Although the picture of a ‘binary’ economic model is a very challenging one (sink or swim) it is a truthful one, which should stimulate fresh-thinking around the need to innovate or merely replicate. The authors describe a leading role for engineers as end-to-end innovators, which will come as a surprise to many in the engineering field who do not currently view themselves as having a role to play in investor management, R&D, sales, marketing, servicing etc. With a strong emphasis on good science, enhanced knowledge management and clarity of communication, this book brings together many of the best ideas regarding engineering education… and then adds a significant measure of new vision and thought. I cannot recommend highly enough this lucid and very timely read. I really like this book. I wish I had read it long before. This book explains how the economy is changing from Manufacturing to information economy. Before every employee was just a soldier who follows orders without thinking so much. If you do that now in manufacturing job then you need to think for yourself & not just follow orders. Otherwise you will get fired. This book is a good starting point from where to start thinking for yourself. Full disclosure I had opportunity to meet author in person one on one who not only bought me lunch but also helped me in career. In today’s environment most of us have felt an uneasiness or uncertainty about our future or our company’s future. The impact on our daily lives, of globalization and the recent advances in information technologies require that we become solutions providers rather than just product providers. This applies not just to companies but to individuals as well. This book gives valuable insights to help us understand what underlies those feelings of uncertainty and provides us with a methodology and commonsense tools to address them. 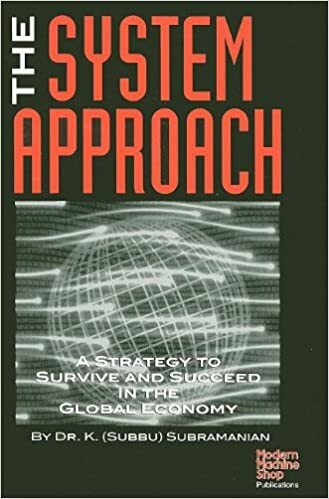 Using examples based on real world experiences the author uses the systems approach to demonstrate how to take back, at least to some degree, control of our lives and the livelihood of our company. This book is a very good read for middle and top management. It talks about some simple commonsense fundamentals that are very logical in any decision making process, especially in an engineering set up/organization. The book explains how any complex process/issue can be divided into simple structures which can then have specific solutions tied to it. By breaking down issues methodically into small discrete systems, it becomes easier for problem solving as well as innovation. Though problems/issues are dissected to make it simpler and transparent, the book professes the need to look at the whole rather than just the issue/problem at hand as the effects or the cause of the problem may lie elsewhere rather than the place of manifestation! The book also explores the way “value” can be added to any process/problem solving methodology and goes into some specifics of how globalization/glocalization affects the way innovation is used in the engineering field.